Despite its calls for ‘more Jakarta and less Geneva’, the Abbott government appears to have fallen into a passive approach to multilateral diplomacy. And as tensions in the South China Sea ratchet up, the Australian public deserves to know more about why their regional foreign policy may suddenly be lurching onto a military track. If this is the case, the government needs to show that diplomacy has been seriously tried and found wanting. But the evidence is that multilateral diplomacy hasn’t been pursued with the required vigor or intensity. On 2 June 2015, reports emerged that Australia was planning to send P-3 aircraft to the South China Sea to assert freedom of navigation. This follows former Defence Department deputy secretary and chair of the government’s Defence White Paper expert panel Peter Jennings call for Australia to be prepared to send military assets to the South China Sea to stop China asserting territorial control of sea lanes in that region. An Australian military aircraft operation in the current climate would be a big step, carrying significant risks of mishap, including collision and worse. But it also highlights the apparent lack of diplomatic energy being applied to this issue. Previously, Australian South China Sea diplomacy appeared to be limited to statements urging claimants to adhere to the rule of law, maintain the status quo and finalize a Code of Conduct. In this respect there is substantial continuity with the previous Rudd and Gillard governments. Australia is aware that China and the ASEAN claimants own the problem — Australia has no territorial stake and hence has taken no position on the relative merits of claims. At the Shangri-La Dialogue in May, Defense Minister Kevin Andrews called for a halt to land reclamation activities. But a number of developments led to the sudden hardening of Australia’s foreign policy to the point of considering a military deployment. There is frustration at the glacial pace of Code of Conduct negotiations in the South China Sea and at China for deliberately impeding these negotiations. There are concerns that China’s land reclamation activities are a preliminary step to announcing an Air Defense Identification Zone (ADIZ) in the area. Most critically, the US may have commenced its own freedom of navigation missions. Since at least 2010, China has maintained that the South China Sea is part of its core interests. 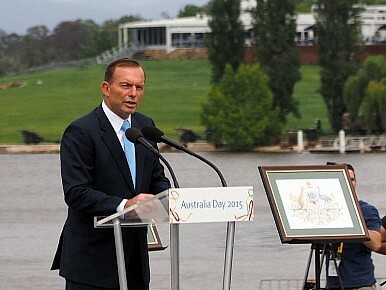 Why hasn’t the seriousness of the situation prompted more energetic Australian regional diplomacy before now? Part of the answer is that, to paraphrase Hilary Clinton, it’s difficult to get tough with your banker. Foreign Minister Julie Bishop objected to the Chinese declaration of an ADIZ, which brought forth a storm of condemnation from China. There were fears the planned Free Trade Agreement would be derailed. Australia may also fear working with ASEAN countries to develop a common position and put more pressure on China. This would contribute to Chinese perceptions of attempted containment. The outcome has been that Australia’s leadership and media appears at times hypnotized by the China choice and trapped between fear and greed. Australia needs to seek a middle path through multilateral diplomacy. It should be working intensively with ASEAN neighbors and China to develop common positions. Australia should not become fixated on grand bargains. It should take a piecemeal, pragmatic approach, seeking to solve problems individually. US Secretary of State Hilary Clinton espoused comprehensive engagement in the region through defense, diplomacy and development. Australia should not neglect the latter two elements. In 2014, Nick Bisley and Malcolm Cook considered what caused the East Asia Summit (EAS) to fail to live up to its potential. They concluded that greater institutional support was needed to ensure that the EAS maintained momentum between summits and had the means to develop policy initiatives. Australia could surely contribute more to providing this. As Australia’s Secretary of Defense Dennis Richardson noted, it ranks 13th or 14th globally in economy size and 12th or 13th in defense budget size. Australia also needs to contribute ideas. One idea that might be dusted off and reassessed is one floated by former foreign minister Bob Carr in 2013: a resources sharing proposal. This would involve an agreement to share resources without resolving conflicting sovereignty claims. The 1961 Antarctic Treaty is a good example of where actors were able to put aside sovereignty issues for common interests. Australia’s regional diplomacy under the Abbott government has mostly featured FTAs and the sensible, albeit belated, support for China’s Asian Infrastructure Investment Bank. The New Colombo Plan is a worthwhile exercise in building interpersonal links and Australia-friendly constituencies in the region. But the plan does not aim high enough and its benefits will not be realized for some time. It is difficult to avoid the conclusion that Australia’s involvement in the Middle East is absorbing too much of the National Security Committee of Cabinet’s attention, leaving little for regional initiatives. In the past Australia acted proactively to help solve serious regional problems with intelligence and energy, as in the case of the Cambodian peace settlement 1990–1993. As Michael Wesley and Allen Gyngell noted this was an issue in which Australia had substantial policy interests but no direct stake, not unlike the South China Sea. Australia’s role was, as described by then foreign minister Gareth Evans, ‘neither front- nor back-seat driving, but the more demanding, but less visible, role of mapmaker and persuader. It was much more an intellectual than a political or military role’. Solving the problems of the South China Sea surely warrants at least the same levels of diplomatic effort. Australia’s future actions should be guided by an independent approach that works to give diplomacy more time. Australia should work closely with the US and regional partners to push back on unilateralism without escalating to premature use of force. Greg Raymond is a Research Associate at the Coral Bell School of Asia Pacific Affairs, The Australian National University and was Director Strategic Policy in the Australian Department of Defence 2009-2012. This article was originally published over at East Asia Forum here.